So, I always have brides on the brain. Am fully addicted to weddings and all their magnificent details (still looking for one to style…) If I could buy bridal magazines without seeming crazy I would. Alas, I simply stalk online in the privacy of my own home. I’ve posted about my own wedding gown nightmare before, and beg of all you brides to not make the mistake I made which was buy a dress based on the label and not how it made me feel and how it fit. It is so disappointing that I did that and I paid for it dearly (so did my father). So in this tight economy I know most brides aren’t exactly looking at Vera Wang’s $7,000 confections, but rather searching for something with high style and a lower price tag. The best label I tried on that was fairly priced and gorgeously made and styled was Watters & Watters Brides. I just was on their site and the dresses they offer are magnificent and very reminiscent of the couture level designs out there today. Good luck to all you brides out there! Look for a post next week in which I’ll pick great items for the home and table for bridal registries- china, flatware, glasses etc.! i would so wear the lela rose dress. so pretty. maybe if hubby decides to marry me again? I did a wedding for a young bride this past summer, she had a dress similar to your last pick. It was strapless and long though. She had collected many varieties of pearl necklaces and layered them, some knotted. It had sort of a 20’s appeal. It was stunning. Good choices!! I am obsessed with ALL of Lela’s dresses- she had not made her bridal collection when I was looking….I need to get married again to Andrew so I can do it right this time around with the dress! I SO share your wedding obsession (I’ve been married for 4 years) and I share a similar wedding dress situation (bought a ML and ended up changing my mind at the last minute…I was in koo-koo-bride-mode). Thanks for this post – Lela Rose is amazing! Do you have any good wedding blogs you can reccomend – Im specifically looking for flower ideas! Any help would be great! I love that Vera Wang inspired gown. Lovely. When I get married I would kill to wear Monique Lhuillier. Have you seen the sketch for her design for Michelle Obama’s inauguration gown? It is to DIE FOR! I just posted about it yesterday after finding a bunch of designers sketches on the Womens Wear Daily website. (www.casamoi.blogspot.com Just the artwork alone is amazing. Can’t imagine what the finished dress would look like! 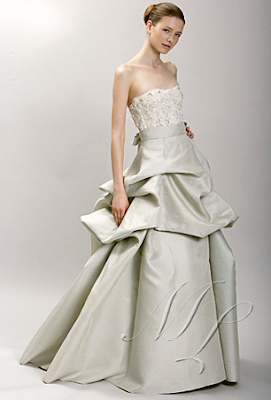 I wish I had known about Lela Rose when I was in the market for a wedding dress! My husband and I paid for our own wedding and reception, so my dress budget was fairly limited. I found a beautiful Amsale dress off-the-rack for about one-fifth the price it would have been at retail, so I bought it at the first bridal shop I visited. While talking budgets, I’ll tell you that my best friend bought her Melissa Sweet wedding dress on Ebay for $500–originally it was over $3000! It was unworn and in perfect condition, a total steal. There are definitely some good ways out there to save a ton of money if you’re willing to be creative. Sometimes I wish I could do it again–with a larger budget and more time to look around–but it all worked out in the end. But I continue to live vicariously through magazines and blogs, so keep the posts coming! The designer of Michelle Obama’s dress (Wu) went to Loomis!